My buddy and I were having a friendly conversation recently about beauty, and why it seems to get squeezed out of society’s priorities. He put up the theory that beauty is optional, and morally neutral. Morally neutral? I got ready to step up on my soap box when he pointed out that you can make laws against harming people, but not against having bad taste. Tell that to neighborhood associations, I said. And I’ve personally wished on occasion to hand over a particularly bad singer to a sound-proof cell. But I digress. 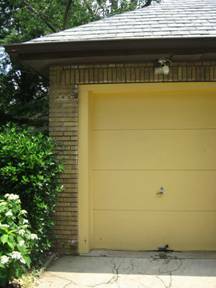 Must a garage door be ugly? Isn’t that like having rusting hulks and garbage piled in the front yard? Call it morally neutral, but I believe there is virtue in blessing the world with beauty rather than bleagh. 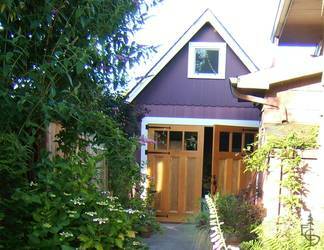 When a neighbor paints their house tastefully, or plants an attractive tree, or puts up a beautiful new door, they are enhancing the view for everyone. That seems like a generous deed to me – a moral thing to do. A lot of garages have low ceilings. Under-house garages in older homes generally were built for smaller cars or even a buggy. I’ve owned a few of these homes, and I have the scars and scabs on top of my head to prove it. To house today’s cars, or an average height human, you need every inch you can get. Obtruding beams supporting the upstairs floor, or plumbing or duct-work, may lower the effective ceiling height of the space. 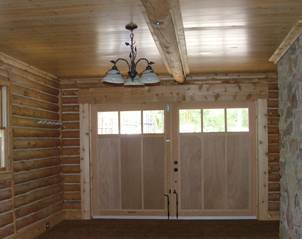 Carriage doors don’t require interior tracks suspended from the ceiling, and they swing out, leaving all that glorious height unobstructed! 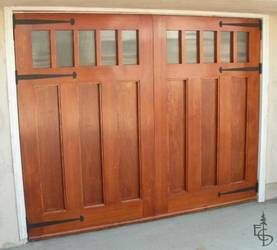 The garage was created to store very large expensive machinery, not to house wine and cheese receptions or a pool table with a hanging light. The interior of the space is not conceived for public viewing. You usually don’t take guests in there to hang out. But you could. 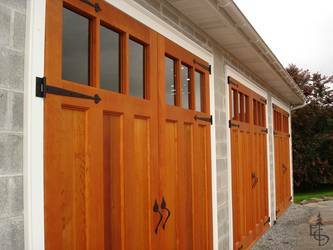 And more people are looking at the garage as the best possibility to add something their home lacks: gathering space. Changing it from an industrial shell for the car to a room with pictures on the wall and throw rugs on the floor could be your best shot at making your home fit your lifestyle. Carriage doors and some cosmetic work can get you there. …And a couple of bottles of wine.